Scania’s new gas engine is designed for long-distance transport and on construction sites. 410 horsepower and 2,000 Nm – well in line with diesel engines of a similar size. A service interval of 45,000 km ensures high availability. Scania’s launch of the OC13 gas engine marks the start of alternative fuel solutions for the new truck generation. The OC13 is based on Scania’s well-proven 13-litre engine. The engine works according to the Otto principle with spark plugs and complete combustion. There is a growing interest in operating vehicles on biogas or natural gas in countries such as Italy and France as a result of increased availability, improved infrastructure and good economic viability for hauliers. The sustainability aspects are also important – even natural gas provides a CO2reduction of approximately 15 percent. Scania’s gas engines are based on stoichiometric combustion, i.e. complete combustion of both fuel and oxygen. Similar to a petrol engine, the combustion is initiated by means of spark plugs. The pre-mixing of the fuel takes place upon entry into the cylinders. The new 13-litre gas engine is always available with Scania Opticruise, Scania’s automated gearboxes. This means, of course, that gear changing and driving comfort are top-class for the driver, with fast, unhesitating gear selections. The tank solutions are an important aspect of gas fuel operations. Both LNG tanks (for refrigerated, liquefied gas) and CNG tanks (for compressed gas) can be ordered directly from Scania. LNG always provides greater range, as a significantly larger amount of fuel is available. In order to improve safety, Scania’s engineers have turned the tank valves backwards, away from the direction of travel. This is a seemingly simple but important detail that reduces the risk of the valves becoming damaged if hit by stones or gravel. Gas engines that operate according to the Otto principle (with pre-mixing of fuel and spark plugs) have shorter service intervals than diesel engines. However, Scania has achieved a significantly longer service interval, with the lifespan of the spark plugs currently setting the limit. Scania is launching an alternative fuel initiative for the new generation of trucks, with the world premiere of a new 13-litre gas engine at the Ecomondo trade fair in Rimini, Italy. 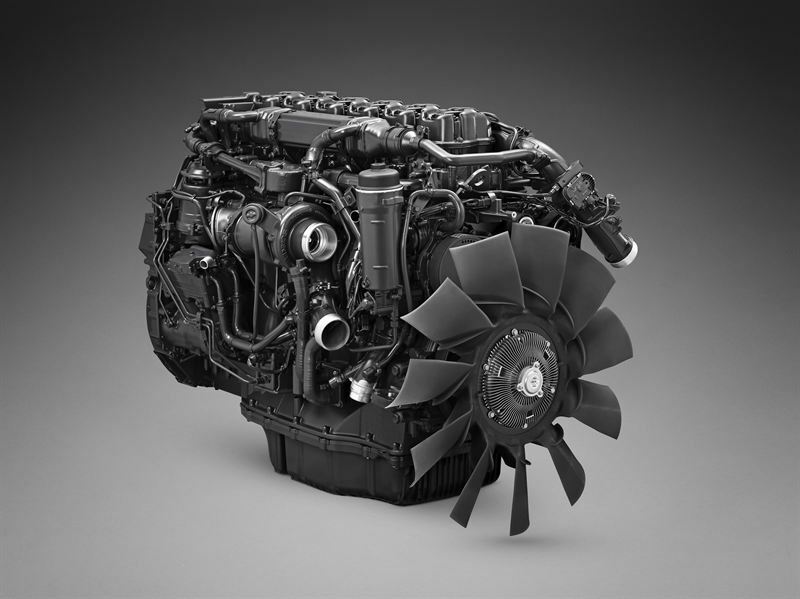 Gas engines are generally quieter than diesel engines, and are therefore well suited for urban environments. Scania’s new Euro 6 gas engine meets the requirements of the PIEK noise limitation standard, which stipulates a noise level of no more than 72 dB(A) in areas with stringent noise limits. Scania is a world leading provider of transport solutions. Together with our partners and customers we are driving the shift towards a sustainable transport system. In 2016, we delivered 73,100 trucks, 8,300 buses as well as 7,800 industrial and marine engines to our customers. Net sales totalled nearly SEK 104 billion, of which about 20 percent were services-related. Founded in 1891, Scania now operates in more than 100 countries and employs some 46,000 people. Research and development are concentrated in Sweden, with branches in Brazil and India. Production takes place in Europe, Latin America and Asia, with regional production centres in Africa, Asia and Eurasia. Scania is part of Volkswagen Truck & Bus GmbH. For more information visit www.scania.com. Scania is a world-leading provider of transport solutions. Together with our partners and customers we are driving the shift towards a sustainable transport system. In 2017, we delivered 82,500 trucks, 8,300 buses as well as 8,500 industrial and marine engines to our customers. Net sales totalled nearly SEK 120 billion, of which about 20 percent were services-related. Founded in 1891, Scania now operates in more than 100 countries and employs some 49,300 people. Research and development are concentrated in Sweden, with branches in Brazil and India. Production takes place in Europe, Latin America and Asia, with regional production centres in Africa, Asia and Eurasia. Scania is part of TRATON SE. For more information visit: www.scania.com.